This is from a kind reader Cyndi whose house isn’t selling. It’s gorgeous home in Saint Simons Island. Before, I get into the “dear Laurel” letter, I just want to say that her initial inquiry was extremely brief and she was not assuming that I would help her. I very much appreciate that. Therefore, I took a look at her home. For starters, I had no idea where Saint Simons island is. It is located in south-eastern GA about half-way between Jacksonville, FL and Savannah, GA.
After looking, at the house, I decided that I would love to do a post about this and Cyndi was game. I am actually taking a little vacation this week. And I know that you guys enjoy helping now and again. So, this is what we’re doing this week. Of course, we will have none of that. Thank you for your understanding. Unlike most weeks, the comments will be published immediately. I may not answer them as I usually do. First, let’s first go over some reasons why a house might not be selling. The house is in a not-so-great-location. The property needs a lot of work. Buyers love and WANT move-in ready. The house shows poorly. Here are some tips that worked for us when we sold our home five years ago. Taking all of this into consideration, I looked at the comps on Saint Simons Island and I feel that the first four are not an issue at all. However, after chatting with the homeowner, Cyndi, the last two might be problems. Still, IMO, this is one of the loveliest homes I have seen when doing a search. And by far, they have the best outdoor space as it borders a golf course. Let’s see dig deeper, to see if we can figure out why this lovely piece of real estate isn’t selling. Oh my God. Wouldn’t it be cool if someone reading this post becomes interested in the home or knows someone who is? My husband and I, both in our 50s moved to this smaller town on the southeastern Georgia coast. The idea was that we would stay here year-round and “semi-retire.” However, that is not happening. I have a position that requires a moderate amount of travel and my husband was just offered a dream job, elsewhere. So, move, we must. We bought this home 18 months ago and did a large facelift. Do you notice the seagrass rugs, some layered with beautiful Oriental rugs? Plus, the color scheme, wall colors and the Van Deusen Blue upstairs? The Blue and White Chinoiserie pieces…? If I had a decorator, it was YOU! As an avid rabid follower, of your blog for quite some time, all I did was follow your advice. I don’t think you realize the power that you wield over so many of your readers. I’ve never used a designer, but always try to buy quality furnishings where it matters most. However, I also have dumpster pieces, along with some finds on Chairish, with a sprinkle of thrift shop. Okay, let’s take a look at the home and property. I will interject a few opinions of my own and more info from Cyndi. An overview of the exquisite property adjacent to a golf course. That’s a huge plus in real estate. They are very close, as you can see to the ocean. Or maybe that’s a bay. Gorgeous property! Cyndi said that they did a number on the landscaping and it shows! Love the Chinese Chippendale railing! The front of the home built in 1984. I think that it falls under the umbrella of a classic-contemporary-southern-coastal in style. How gorgeous is this!!! The property is enchanting! I can see why they purchased this place. The only thing I don’t see is a pool. Now, I know that might be a deal breaker for some. But for others, a deal maker as they don’t want a pool. My guess is that more want a pool, since many of these residences are used as vacation homes. Let’s go inside the house. We walk into an elegant entrance. Love the mouldings which they added in their facelift. The creamy wall color is pleasing. Lovely taste, they have. The ceiling looks to be about nine feet. The only thing that’s bugging me are the photos. I can’t stand most “real estate photos” and disagree with their propensity for distorting the home to make it look like something it’s not. Here they’ve made it look like it’s about 50 feet to the back wall. Based on other photos, it’s probably closer to 25 feet. This distortion is actually making this area look strangely long, and it’s not. Another thing about real estate photos is that they take the images with all of the lights on. If you notice, interiors in magazines, rarely have the lights on. Having the lights on gives the rooms a “brochure feel,” IMO. And by that, I mean a somewhat plastic feel. And, I know that is not the case, in real life. A long sofa table behind the sofa would be lovely. And I’d love to see some greenery. Here are some ideas for house plants. And there are some beautiful house plants here too. Turning around, we will see the dining area and kitchen. The stunning chandelier is just the ticket! The kitchen is on the small side. Plus, it being so open with the fridge as a focal point of sorts, may not sit well with some buyers. On the other hand, more casual people who enjoy entertaining, may love it the way it is. Here are a few ideas that I have. I think that a drape on both sides of the entrance going into the living room would give a sense of separation and wouldn’t be an expensive fix. They could be simple white linen drapes. I would put them on this side of the entrance, right underneath the crown moulding. Yes, it’s a little close to the doorway on the right, but I think that it’ll be okay. Ugh. There’s so much distortion in this image. That’s not their fault. Cyndi said that they have had four sets of photography done! This house is IMPOSSIBLE to capture! Here are some more comments Cyndi made about the decorative details of the home. entry hallway moulding- not my proudest project- architecturally incorrect on a business trip. We did Benjamin Moore Manchester Tan HC 81 (one of your Laurel Home colors!) on all walls -matte HC 81 @1/2 strength on Ceilings and HC 81 semi gloss on trim and doors. As you can see, the first floor living, dining and kitchen are very open. This is something that buyers will either love or hate. If they watch a lot of HGTV, it will probably be the former. And, honestly, I did think that they had professional decorating help with this home. It shows beautifully. Lovely colors, furnishings, not cluttered, but not devoid of all personality. An adjacent family room. This, I think, could use some big fiddle leaf palms by the windows. Ideally, I’d like to see end tables flanking the sofa. But none of this is stopping the house from selling! This is a very pretty room! Let’s look at some more photos of this stunning coastal home in Georgia. Master. Looks like Phoebe Howard did this room! I think that this is a guest bedroom. Cyndi confessed that she’s not crazy about this room. It’s not terrible and maybe some people would love an upstairs retreat that doubles as a guest bedroom. Fabulous bedroom. Have to say that all of the furniture looks like stuff I’ve put on my hot sales and blog post widgets. I LOVE the wall-to-wall seagrass in the bedrooms! Gorgeous bathroom with blue and white toile wallpaper. And I do believe that is the Kohler Memoirs toilet and pedestal sink. Another terrific room off the balcony that serves as a multi-function space. There are more photos on the main real estate listing with their broker Banker Real Estate. Another detail that is specific to this area is that people LOVE very high ceilings— like 12 to 20 feet high. Ours are a mere 9 to 10 feet in places. In addition, most buyers prefer five or six bedrooms so large amounts of people can vacation. By the way a broker came to an open house yesterday. Rave reviews. I’ve begged for any criticism- Nothing???? Well, Cyndi, this is why I’m posting your home. :] There is nothing wrong with anything that you’ve done. It is pulled together, move-in ready, tastefully and stylishly decorated. Sure, there are a few possible sticking points. But, these are relatively minor, I think, in the scheme of things. The very open concept layout on the first floor. Smallish, and too open kitchen. No pool. Fine. They can put one in! Higher ceilings? Well, we can’t change that. more sleeping space? How about turning the bonus room into the kid’s space? Air mattresses, cots, whatever. They don’t care. I would add more greenery in the rooms. If possible, better more intimate photos that don’t try to get more than the eye can see at one time. The distorted wide-angle shots and the lights blazing are what give these photos an unnatural look. Of course, this is only my opinion. And despite, that, I think that your home shows very well. Okay, I’m officially on vacation. Can I tell you how fabulous it is to spend some q-time with my adorable son? I’m throwing this out to y’all, if you can think of any quick fixes that would help this house sell, please share. But, actually, my sense is what this house needs is more eyes on it. After all, it only takes one set to fall in love. Therefore, please pin these images to your pinterest boards, share on facebook and twitter. There are buttons if you don’t realize, a the bottom of the post. And again, the official real estate listing is here. If you don’t see your comment, it means that it crossed the line into insulting. And a few more are borderline, but I let them go. Please put yourself in Cyndi’s shoes. She kindly let me use her home for a post and it wasn’t to trash her decorating choices. That means no more about her taste, her style, etc. It’s Irrelevant and totally not helpful. I just stayed in a “beach home” on the tip of Cape Cod– 500 feet FROM the beach in Provincetown. The house is an 1840 Greek Revival beauty that’s decorated with two dark brown Chesterfield tufted sofas in the front parlor. And while it wasn’t what I would have done, I appreciated it because they look great in the room. There is more than one way to decorate a beach home. How sad it would be if everyone’s home looked exactly the same! I looked at a dozen or so homes in this price range on Saint Simons Island and none of them were decorated nearly as nicely as Cyndi’s. The exercise is to work with what is there. Sorry, if I didn’t make that clear. They are not making any major changes. Yes, it’s fine to talk about removing some of the rugs or painting the ceilings, or adding more color, greenery and changing color of the towels, etc. ; that sort of thing. However, there are NO musts in decor. And, I don’t care if a home is by the ocean, above the Arctic Circle, in the dessert or the middle of a swamp. That is the premise of this entire volume of over 550 blog posts. I still feel that the biggest problem is the photos/artificial lighting. The photos are making this home look far more formal and stiff than it is. I repeat. It is the photos. And I agree that the shadows are creepy, particularly outside. That has nothing to do with the house. The exterior shots should be done on a cloudy or mostly cloudy day. And the second biggest problem might be marketing. Not sure because I have no idea what’s been done and neither does anyone else! Thank you for your understanding and thank you to the many who took the time to give some truly helpful and in some cases absolutely genius suggestions. Wow- what great and interesting comments and suggestions! I love hearing from the professional stagers, realtors, and the locals who know the market! As a real estate agent, one suggestion I would like to make, that I don’t think has already been said, is to highlight your property’s unique and especially desirable lot size and location by including a “satellite map” type of image in the listing that shows and labels, (with arrows) its relation to the downtown area and any other desirable locations or features. It should also outline the property boundaries, water access, docks, or trails to the water, any other trails nearby, or whatever. Someone looking at your listing who is from outside the area wouldn’t appreciate this unless you show them! In my local area, a realtor did just that for a similar type of high-end property, and it sold amazingly fast! It was in a “water-access” community, and the realtor drew in the trails through the woods to the water, showed arrows to the community dock, park, showed how big the lot was, etc, all on the satellite map. I thought it was very clever of that realtor, who was not from our area and probably did not take for granted (like us locals do) that outsiders would understand what the neighborhood and particular property offered unless she showed them! 2. The stucco or whatever it is (someone called it tabby shell?) looks like OSB (oriented strand,aka fiberboard board) to my non-island eyes at first glance. -Perhaps better photos or sun-angle (or corrective lighting done in photo-shop–not faking it of course) could make it look better? Maybe a better trim color? 3.) You can tell the owner was influenced by Laurel’s high-end New York style of interior design, as she said she was. It is nicely done and very pretty, but perhaps toning it down to be a bit more relaxed and more “southern coastal style” might help, as many have said-though even poorly decorated homes sell every day, so that isn’t probably the major issue. Cyndi, you have a lovely home – your hard work is visible everywhere. I agree – as a previous professional video writer/producer – the photos are an issue. The house reads cold because the light reads cold – this is a white balance/color temperature issue. A pro photographer can do much better and it’s worth it to fly one in if necessary. You’ve been inundated with suggestions, so I’ll leave be except this one. Good luck and I know you’re tired of “getting it ready to sell,” but dig deep for one more round and get new photos and select just the advice that rings true for you. And your realtor needs to re-write your listing copy – it’s bland and vague. 1) Replace the artwork in the entry with art that is more contemporary and has p color relating to the items in the living room. Keep it clean and unfussy. 2) Living Room – replace the fireplace screen with one that has cleaner, less detailed appearance. The eye is pulled too much to the fireplace screen and not the qualities of the room. It will also bring a more contemporary feel to the space. 3) Kitchen – replace the vase on the counter with a warmed colored wood bowl filled with oranges or fresh herbs. It will add some desired warmth to the space. 4) Add a sofa table and at least one lamp behind the blue sofa in the family room. Or add end tables with reading lamps. This space doesn’t look like it functions like a family room. It reads like a formal sitting room. Perhaps change out the upholstered ottomans for a hard surface table. Do not add glass tables. This spaces need the warmth and functionality of wood to capture a buyers interest. 5) The master bedroom. I’m assuming the photo was taken from the entry way of the room. If this is so, I would move the bed to the other wall to the left. The eye is immediately drawn there in this photo ( and will in person) , versus where the bed is currently placed. It would provide the room with a more balanced and powerful master statement. Once the furniture is moved, if there is a blank space where the bed and right night stand used to be, I’d recommend a chair and small table for reading, putting on shoes, etc. 6) Master Bath – replace the artwork above the tub with something more contemporary, again with pops of color that connect with the master or decorative item made of warm wood. It’s a beautiful bath. It appears to read a little cold and dated from the accessories for a large segment of buyers. 7) The bedroom with the day bed and strong turquoise drapery. This is room is lovely. The drapery, is rather heavy and overpowering. I would replace the drapery with something more neutral and flow-y. 8) I can’t tell from the listing what the front door looks like. Actually where is it? I would have your photography remedy that. Buyers want a clear shot of the front entry. It appears the front entry (making lots of assumptions based upon the photos in the listing) has no warm wood and blues and oranges as you do throughout the home and in the back patio area. If you don’t have this at the front entry, I would recommend adding some interest at the entry. Color is extremely powerful. I personally use blues and oranges a great deal when I sell my properties, as buyers from broad backgrounds and ages find it current and appealing. I am a Realtor of 24 years in a high-end beach area and I totally agree with your dislike of real estate photos. Every time I’m at a photo shoot, I emphasize that I do NOT want the distorted photos. Time and again, I get these. I have searched for a photographer who can give me an editorial view of the house, like in a magazine, with vignettes, views and details. So far, no luck. This home is fabulous! My parents live outside of Jacksonville in Sawgrass and this house reminds me of their neighborhood. The owners obviously have very good taste (IMO) and they’ve done a beautiful job of upgrading, designing and styling their home for market. Of course, we’re not seeing the surrounding area, the neighbors, etc…and perhaps there is a lot of inventory on Saint Simons currently. I like your idea about more interior greenery. This may sound silly but it looks like there is a painting or print of a clown on the back wall sort of across from the staircase but visible when entering the home and while in the living room. While many love clowns, there are also many who find them scary! Again perhaps silly but I would propose switching it out for something universally pleasant. The owner mentions that buyers prefer 5-6 bedrooms and as you said the upstairs bonus room could easily sleep several children. Though they don’t want to make major changes, that room could be transformed with the addition of two double size bunk beds with great looking linens! A friend of mine with a farm property on Orcas Island in the San Juan’s has a large room for children with three bunk beds and it’s everyone’s favorite room and sleeps six kids!! I think it’s absolutely beautiful. Your decor may be a bit more formal than a typical home at the beach, but as someone else said in the comments (I only got so far reading), buyers at that price point should be savvy enough to recognize good taste & see where they can go with the bones of the home. The kitchen, while beautiful, looks a bit sterile with the empty countertops. I would put a few things out that look like someone is actively living there- a bowl of apples, tray with coffee, pedestal cake-dome thingy with a sliced pound cake in it. Two homes in my neighborhood recently went up for sale- one is absolutely beautiful & sold with a bidding war before it was even listed (1.25 million). The other is ugly as sin (but has a pool), has been listed for months, has been reduced from 1.3 to 1.1 and it has had no bites. Square footage-wise, they are comparable. Cyndi, it is a very nice home and it has not been on the market very long given all the homes for sale in that area. Every buyer will have their own perspective. I took the virtual tour and studied all the photos. I will note my thoughts with due respect and humbly because I am not a pro. The only major concern I saw as a buyer was the formal living room. I think it is the layout of the furniture that bothers me. It is really a nice big room but it is being treated like a room with 2 walkways. Here are my ideas that may or may not fit depending on the room dimensions. I would remove the long runner. I would rotate the main rug and move it more central between stairs and fireplace. Then I would rotate all of the furniture. That would move the sofa to where the 2 matching beige chairs are located, those 2 chairs would move to where the 2 orange chairs are and the orange chairs will be where the sofa originally sat. I would also slightly angle the chairs toward each other. I am trying to create a space that is larger and the traffic can flow next to or thru the space. One of my landscaping books pointed out that it is unnatural for us to walk in straight lines and make 90 degree turns. By eliminating the runners and softening the edges you may escape that feeling and gain another foot or so. With the curtains Laurel suggested, I think it would be very eye catching as folks make their way thru them and into a less delineated space. Also, you may have a piece of furniture that would fit nicely under the stairs. It would have to look nice on both sides but could provide storage for the kitchen. 1. Take the TV out of the living room alcove. 2. I would put a classy but casual blue/white/orange/green patterned tablecloth on the dining table to link the entire first level together. 3.The storage piece in the family room highlights that storage is difficult in that room as well as hiding a main feature. Remove to upstairs blue suite? 4. I love all of the bedrooms! The doors in the teal room were mentioned by other folks and I think putting glass knobs might soften the look and align it with the room’s flirty feel. 5. The bathrooms are wonderful. Replacing the navy shower curtain in the narrow one with a more soft and airy light colored curtain may reduce emphasizing the narrow space. As mentioned, the real estate agent is key. I noticed you reduced the price rather quickly. The rule of thumb I was taught, was that if no one is making an offer it is not about the price. You just have to wait for the family that sees it fits their needs. here, and the owners were speechless when the final offers came in. (As was my husband, a Realtor for over 40 years, who still grasping the magic of staging!!) The last home he listed, I only got it about 75% staged before it sold in 5 days, very close to asking price. Another surprised Seller. GENERAL NOTE TO SELLERS – DON”T TAKE ANYTHING PERSONAL, PLEASE. If you expect to sell your home with your personality, you are almost always leaving money on the table. Great staging isn’t just paring down to minimal furnishings and décor. It’s showing current décor that creates a warm, welcoming, comfortable home. It doesn’t have to be overdone, just bringing 1 or 2 current “WOW” factor/s to every room, or at the very least, the important rooms that will make buyers fall in love & connect with a home. Often it’s showing buyers how they can arrange furniture & decorate to make a home that feels “New.” So many people are lacking in the “how to” and imagining what they can do. There were so many fabulous suggestions from your “following.” However, many would be quite costly to do. I just don’t recommend putting a lot of money into “improvements.” It’s not necessary, and I’ve seen so many torn out by buyers, no matter how “on trend” it is. ~ Homes today need elements of entertaining & fun! This home most certainly should, needing decorating elements that reflect the location & lifestyle. Coastal, Bahamas style décor always appeals. ~ They have beautiful lighting!! A huge plus, it being the jewelry in a room. ~ Do Not agree with removing rugs and showing more floor. Besides the floors being dark, which are buggers to keep clean, etc, it’s a very cold look not to have area rugs. With today’s indoor/outdoor rugs being so reasonable & great looking, they don’t have to break the bank to have the elements of warmth & even design with area rugs. My husband just sold a home where the homeowner put in new, expensive, dark woods; doing even more after saying how hard they are to keep clean. The new owner immediately tore them all out! If he wasn’t so positive he knew what buyers wanted, he would have listened to advice and saved a lot of money. ~ Throughout, you definitely need to add great pieces of art and to incorporate some bamboo, rattan, even today’s industrial style pieces. (Craigslist, yard sales –we have a facebook local yard sale site, letgo, etc. I get great pieces for $5 and $10, including large pieces of art. Many times I buy it for the frame and I switch out the art with poster versions of whatever type of art I’m going for, vintage art posters, Monet, modern art, etc. Here is a link to some desirable bird Audubon prints that you can download and order any size prints from Office Depot (sale 2 for 1), custom canvas prints, etc. My last order for (2) 24’x36” prints mounted on foam board came to a total of about $50. I had frames, but have also hung art on office clips (black one come in all sizes) hung on a thin nail or sturdy straight pin.) Some over $10 items are well worth buying when an item is a fraction of what new would be. ~ Key elements to marketing a home, ART, ART, ART. Greenery, Area rugs. These can overcome just about any dated design flaws. ~ Yes, Yes, Yes Laurel is 100% correct about the professional photos. Get the photographer recommended in your area. I feel the common “trick” photography amounts to false advertising. And, I’d be aggravated as a buyer getting to a home that is no where near as spacious as was shown. It’s just wrong. ~ Do Not change Realtors so quickly. They also make an investment in your home marketing it, so please give them a fair, reasonable chance. Quite often the things that can be preventing a sale, aren’t their fault. Ads, not matter how fabulous, can’t make buyers connect with a home. As a matter of fact, they can be a let down after reading some ads (like the distorted photos.) Realtors are cautious about giving any advice on what to do, because sellers can take it SO personally, as already mentioned. In closing, you have a wonderful home that just needs some tweaks. It will be easy, and most of all, it will be fun!! Hello Sheila, I checked out your Pinterest link and in the essence of Staging, IMHO the “style looks” in those photos include WAY too much “stuff” and scream “Home Goods” which would be distracting to any potential Buyer. While clearly much of this will always be “subjective” to one’s personal taste, I think the home design now is sleek enough that virtually all buyers in that price range would be able to see around what is there. A few things are dated, yes. Nothing is offensive, it’s not new construction or a model home. The Seller can choose to change some or all of the dated things in the hopes of recouping more money or realize they may spend more than the extra sale price or cash saved in a quicker sale will bring. Only they can make that decision. Personally my vote goes with the CHERYL and especially SUSAN BATASTINI… either go as is or put some money where it’s really going to count, where you’ll get the maximum IMPACT. Play up the Southern Charm by replacing the dated patio sliders with French Doors that open out – that change alone would update the entire first floor and be appreciated from the moment of entry! And, put focus on that amazing SECOND FLOOR VERANDA! Set that up with a scene that shows it as a place to read, relax, have breakfast or an afternoon Sweet Tea or Lemonade! Who hasn’t at some point fantasized about having a home with that feature! Especially in the South. Switch out the dated louvered bi-fold doors in the Turquoise Bedroom and you just made minimal changes with some heavy impact that plays on the essence of Southern Style home in such a setting. What a fun assignment! I hope you’ll abstract the best ideas in a future post! Laurel, I am so happy for you that you are taking some time off. My first reaction to the homeowner’s dilemma was that the potential buyers must be nuts–great house! But I did look closer and checked the listing. I have some thoughts. 1–Everything is pretty squared off, almost like someone took a tape measure or snapped a chalkline to center every stick of furniture. I only see a few circles–in the lamps and starburst mirror. I get it that the famous designers do this symmetrical, squared off thing, but my impulse would be to go in and budge some things around. The right angles and predictability make it seem static, I feel. Consider putting some things on an angle, or adding rounded or softer items. 2–Living room–I agree with the person who suggested getting rid of the runner, moving the other rug away from the fireplace, and spreading the furniture out. It’s okay to cover that floor plug, since you’re not using it. I’d think about angling either the rug or the furniture to give the room more life, and maybe getting rid of or repositioning one of the pairs of chairs. Everything seems so safe. 3–Sunroom–The sofa is the focal point as the room currently is, and this is probably not what you want. I’d put it elsewhere in the house and maybe just spread the two chairs and ottomans apart a little. I agree with the people who didn’t care for the credenza being up against the window. 4–Patio–The photo with the view toward the house shows that that side of the house is not so exciting. My suggestion is to put either the orange table with the fern or the other table with the lantern over by the house, to kind of draw attention to them rather than to the house itself right there. I would place the furniture or the rug on an angle. It looks kind of static. 5–Outdoor views–Only a few of them show the house off well. Some of them make it look tiny. 6–The room with the big white table and the yellow chairs–angle the chairs and put a game or something on the little table. Find a piece of yellow and blue fabric and put it in there somewhere, maybe draped over the table. 7–Realtor–We attempted to sell a higher end home about 10 years ago. It was the nicest home in the area with a great view of river and rocks, but in a flood plain. We did some price reductions, but what really did the trick was changing realtors. The house sold three days after we changed realtors. I love CYNDIA’s comments on switching the living room with the family room furniture so won’t go into detail about that other than to say that I too felt a “surprise” from the timeless foyer to the stylish but dated feeling living room. The sad part is that people today think every home needs to be staged and there is so much subjectivity out there about what style it should be. I feel if a property is clean, tasteful and decluttered without bizarre wall colors, and no musty smells, you’re good to go. Buyers need to look at the bones of a house, what will remain after the Seller’s furniture is out – look at the kitchens, baths, storage, check for mustiness and functionality of the important stuff (plumbing, electric, heating, roofing, etc.) Barring something offensive, change what you’ve got and you could miss the sale of the person who would have loved it as it is. What we don’t know is: Are there any air fresheners, potpourri or offensive “Yankee Candles” burning? Or dominant cooking smells? I would guess not, the home looks pristine, but we don’t have smell-a-vision yet, so, just saying. Keep in mind one person’s idea of a nice scent may be another’s allergy trigger or sense of covering up something instead of a fresh clean neutral scent. I have literally exited at the foyer of some homes with dominant scents, potential buyers can feel that will never go away and it’s so “of the past occupant!”. As for the PHOTOGRAPHS! OY!!! Disclosure: I am a professional Photographer, ASMP, specializing in Architectural Interiors. These photos are an example of why I stopped shooting for REALTORS!!!! The deceptive photos are a huge pet peeve of mine and that is how most RE Photogs are shooting. If I decide to look at a home after hours of “screening” on the internet, I don’t want to THINK I’m seeing a 50 foot deep space and get there and see a 20 foot space! Why can’t Realtors realize this deception ticks people off!!? I don’t have that time to waste and I think it’s insulting to the general public that realtors continue to allow their photographers to shoot that way. And shame on the photographers that lure the stupid Realtors into this way of deceptive representation! It’s like a Match.com photo that looks good then you meet the guy and find the pic was from 20 yrs ago or photoshopped to the nines! What were they thinking, what are Realtors thinking!? The right way of shooting a home is to start at the front of the home with all of the pics in order which is better than any video tour, giving an indication of what each room leads to and connects to. The proper lens and lighting should always be used. As for lighting, Laurel is correct that many of the Interiors magazines show spaces shot with the lights off. With the right natural light entering the room this can produce a beautiful pleasant image. However I see many where turning on the lights would have enhanced the scene and in Architectural photography except where there is exceptional natural light streaming in the windows, lights SHOULD be turned on in an interior space even during the day. My philosophy is that a space should be photographed to ACCURATELY reflect how it looks so one can imagine themselves there along with the CORRECT LIGHTING that shows the actual colors and ambiance one actually feels when standing in the space. No on-camera flash or fake over exposures for brightness! If a room is dark on the other hand, a photographer’s job is to make it show at its best, so maximize the natural light (open blinds/shades/drapes), turn on the lights and use professional off camera flash and if needed, reflectors/soft boxes/umbrellas to show the room as it would look properly lit. The huge “no no” in any case are CFL bulbs! Be sure if you are going with these energy saving bulbs that you purchase those producing warm light K settings, otherwise entering your space will look dull, dreary (like the cast of fluorescent lighting) and to prove that, snap a pic even on your phone… you’ll see a greenish cast – not appealing for resale. That being said, bulbs look fine in this home and it looks shaded enough outdoors that the indoor lights ON are likely a necessary enhancement – especially the beautiful kitchen fixture. Being lit showcases it, turned off, not so much. While cloudy days are great for photography because of the soft light they create – with no harsh shadows cast, I don’t see that home shooting well on a cloudy day with all the surrounding trees. It could make the setting look quite dreary and not inviting. Skies would have to be switched out via photoshop with a blue sky sunny day to make it work, HOWEVER, the result can be fake looking. One more PHOTOGRAPHY THING and I think someone else mentioned this as well. I agree on skipping the aerial shot. While nice to see the adjoining golf course, my first impression was gee, this home is in a desolate spot…. so much woods there must be…. (let’s just say “some scary critters!”). OY! I find it sad that if people see a home with two rooms used as a bedroom and one as an office or sitting room, they act like it can only be a two bedroom home! Or a Dining Room space set up as an Art Studio, the Buyers would move on and say “we need a real dining room!” That’s the reality of today’s Buyers and it stinks! Most people for some strange reason cannot think beyond the purpose the Sellers already have for a space! It’s crazy. I could go on….. In any case, IMO this is a beautiful and tasteful home, any changes would be of personal items moving with the client anyway. In fact, I’d want her to leave some of her beautiful things! You have done a great job of decorating your home — the challenge is that it’s not “staged” for a buyer in the lowcountry. That style is more relaxed and beach. You are close to where you need to be, but I think that the beige and too warm paint color is throwing people off. You don’t need to repaint your entire home, but maybe just the kitchen and living area to something a lot lighter — such as Benjamin Moore White Dove, BM Cloud White or BM Simply White. I feel White Dove or Cloud White are the safest since Simply White can turn green if there’s a lot of greenery reflecting outside. The other comments about removing some rugs are spot on. I would go for a casual yet elegant Tommy Bahama/West Indies look. To do this you add more greenery, some bird prints, and a few baskets to make it less formal. Over the kitchen counter you need a couple of somewhat modern pendant lights — such as lanterns like the Darla Visual Comfort lanterns, or Ballard Designs has nice lanterns. I live a couple of hours from you near Hilton Head, about your age, and our homes have been in this price range. As a buyer, I would hesitate a bit because of all the Edgecomb Grey and the formality of the house for a casual setting. If you just repaint the kitchen and great room to something lighter and more current, add the pendants, a wood-stained ceiling fan in the family room, remove some rugs and drapery to open it up and be more casual, I think you can sell this. I wouldn’t have more than 12 of your favorite photos. And they can be close up of just one area or one seating area. Laurel is welcome to give you my contact information if you would like me to meet you at your house to give you more detailed ideas that won’t be hard to implement. I marketed and staged my last home and it sold in four days with two full-price offers. The interior photos are beautiful. The house is bright, clean and clutter-free. Do not add any accessories or furnishings. The only condition issue I see are some dark spots on the exterior. Problems could be the location within the neighborhood and the listing presentation. The lot looks huge and possibly overgrown, isolated and lonely. Delete the aerial photo and substitute a welcoming picture of the front entrance. Also picture #1 should be the front entrance, not the back patio. The listing (Zillow and Realtor.com) pictures should follow a buyer’s natural walk through the house. Front entrance, foyer, living room, etc. 45 photos is too many; 25 should be the max. Eliminate the close-in shot of the kitchen. Maybe show two different views of the major rooms. One photo per bedroom and bath. Wow, what a gorgeous house! Everything is simply lovely. I had a bit of a jarring moment going from the traditional foyer into a very modern living room though. Everything in there is beautiful, but I think an easier transition of styles would be nice. I agree with the commenter who suggested removing the seagrass rug behind the living room sofa. And I would actually swap the furniture on the sun porch with the living room furniture. Move the blue sofa and cream club chairs into the living room, and completely remove the orange chairs. Keep the orange print accent pillows for the chairs, and use the cream and orange pillows on the blue sofa. The coffee table would stay. Move those large blue ginger jars from the sun porch and put them on that large credenza in the living room. In fact, I’d be tempted to swap the credenza in the living room with the whitewashed piece in the sunroom, and put the modern lamps in the sunroom. .
Now, in the sun porch, use the more modern cream sofa and chairs, keeping the ottomans, but arrange all in a less formal way. I’d remove the two chairs in the bay window as well, replacing them with some beautiful plants. Finally, I would stage the turquoise room and the bonus room as bedrooms. The bonus room would be a great bunk area for a bunch of kids. Now get some new photos done by a professional photographer, and find a selling agent that knows how to write a good description and market well. Lovely home! My sister-in-law has two homes in St. Simons so I have visited. I am from the West coast now so don’t know the vibe for the more Southern formality when living in a vacation environment. I have helped people stage their homes and you get to a point where you just have to say that if a buyer cannot visualize a different scenario, then tough. This is where a good realtor should be helping the buyer visualize. 1. Take out the rug that divides the living and dining spaces. 2. Get a top rug in the living area that has a bit more color to it for differentiation. 3. Move the living room rug, if it works, to line up with the edge of the cabinet to the right of the fireplace (or split the difference) and then spread your living room furniture farther apart. It is cramped into a pod. Too much space left on the right side. I like to feel like I can walk into the conversation pod and not have to squeeze my way in. Space = luxury! 4. Many hard surfaces. Painted wood, ceramics, photographs in rigid frames, metal, etc. Baskets are a cheap and plentiful way of softening — and there are some more tightly woven ones that can blend with your more formal style. Use a basket tray on the kitchen counter or a wooden bowl with some fruit. Basket trays are great anywhere in my opinion. Use one on under a group of your blue pottery in the guest bedroom. Pottery Barn has some nice ones. Use some pillar candles on coffee tables or side tables in their natural state (not in containers) on one of your nice ceramic plates or group different sizes on a platter. Use BIG baskets by the blue couch in your casual room (cheaper for now than side tables) and roll up some blankets in them or if they are smaller put some magazines. This will tone down the rigidity of that couch. Stack books under the very tiny plants you have used. Get BIGGER plants and have them fill space with greenery. Yin and yang. Counter all the ‘hardness’ with some softness and natural materials. Look in your closets and think about how to use what you have in different ways! Let’s get a nubby throw drapes over that blue couch to relax it some! 5. Yes, sofa table behind the living room sofa and a table or an antique chair on the wall across from it. Get a basket with a big ole plant in it for one of them. A lamp with a fabric shade that is textural. 6. Think of getting a outdoor rug for under your conversation pod on the patio. The floor of the patio is the same color as the walls of the house and it looks anemic. Ikea has decent looking ones for cheap. maybe a cluster of pots with plants where the side of the house meets the patio surface. 7. Big ole basket at the foot of the guest bedroom bed for some texture and naturalness. 8. I would evaluate everything you have a plant in for size and for a different option than ceramic. And think of things for the wall that are possibly not a framed piece of art. Could be an oil painting with no frame, a painting on wood, a basket, a wall vessel with dried or real flowers on the wall or fiber art/small rug to hang. 1) The main problem is the wide-angle lens is distorting the room proportions and making the rooms look too wide and the ceiling too low. Re-photograph with a normal lens. 2) Too many rugs – looks like a runway. 3) Paint all the ceilings downstairs a pale blue. Not only it that a southern tradition, but I think it might lift the ceilings visually. So the same for some of the upstairs rooms too. 4) I think the exterior should be white instead of a sandy color. Beautifully decorated home, Cyndi! I would reorganize the photos, as I don’t believe they explain the flow of the home. I would start with your best one or two photos of the front of the home, then the entry and the downstairs common rooms. There is no photo showing where the microwave area connects to. I assume it’s under the stairs, but a wider shot of the kitchen showing that area as well will make the kitchen look larger. Then the master bedroom and bathroom. Delete the photo of just the tub, but where is the shower? Then the other bedrooms and bathroom on the first floor. Next, show the stairway up to the second master, then show that bedroom, bathroom, and the balcony. Lastly, rear exterior photos. I can’t tell from the listing photos or written description whether you actually back up to the golf course, or whether it’s just in the neighborhood. How far from the beach/other amenities (by golf cart ride or walking or whatever)? Is the second master suite the only thing upstairs? If so, call it a second master suite and say it has a PRIVATE screened balcony/porch. That would appeal more to people wanting more privacy for adult children or other adult relatives who visit. I would stage the turquoise bedroom with more beds (at least two twins, or maybe a bunk and a twin), and ditch the seating and desk (or use the desk as a nightstand in between the beds). I would stage the upstairs bedroom as a master bedroom. You’ve already got two different living/family room areas downstairs as it is, so a third is overkill because you want to show how many people the home can sleep. In the description, play up the indoor/outdoor living and the amazing outdoor spaces you have. The description can do a lot more to show off the features that make buyers get excited about a property. the seagrass rugs are a little too bland for me. Also putting something on the back side of the sofas. I think the house is gorgeous, must be overpriced, who knows. some people probably need to be closer to civilization. Hello Laurel, Interesting how many basic points come out repeated in several comments, so I don’t have to harp on them too much. The distorted photos not only make the house look peculiar, they would probably cause distrust and confusion in those who have looked at many houses. I also agree about the open staircase, especially if that is supposed to be the main one. The door at the top is a psychological nightmare, Edith Wharton notwithstanding. This post has made me realize something about many of the interior photos I have been seeing recently. In large open spaces, rooms are indicated by islands of rugs with no relation to the walls, which surround these impenetrable islands across their moats of wood or stone flooring. * This looks bad and makes me feel constrained, as though no comfortable activities could go on in that room. I would get rid of some of the rugs (as others have suggested) and relate the room stage-sets to the walls and to the entire floor plan. These seem like quibbles, but I guess when people are spending that much, small defects loom large. This is going to sound weird to most readers, I fear, but looking at the exterior, my impression was of a house pinned under blazing sun, and the spidery shadows of the trees shading the house only heightened that impression. I’d hoped that the interior of the home would contrast, would be a respite from that mottled exterior, a cool, visually simple, aesthetically “clean” break from that outside visual. So, looking at the interior, I was dismayed that the otherwise impeccable surroundings were again disturbed by shadows…this time of the lamps, which cast very explicit lines onto what would otherwise be unbroken areas of light on ceilings and walls. I’ve worked in film and comics and now paint, and this was the only “flaw” I could see (other than lack of a pool, which is easily remedied) to account for why this nice crib hasn’t moved. It’s a very pretty house in the pictures. There are a lot of very good comments and I agree with many of them. – Too many rugs as you enter. Remove the 2nd one in the living room that you see from the front hall. – Replace the clown painting with something else – clowns creep me out. – The front hall mirror is beautiful, but too ornate and doesn’t fit with the rest of the house. Go to Lowes, Target, Home Goods and get a more contemporary/transitional cheap replacement. – The staircase is my biggest “offender”. I’m sure it contributes a great deal to the openness of the floor plan – but the open risers just seem like an accident waiting to happen and the closed door at the top is not inviting/enticing anyone to go upstairs. – I think of family rooms as casual gathering places. This family room is not that. I like the idea of replacing the chandelier with a ceiling fan. Lose the blue velvet sofa. And, where do you put a TV? – yes -maybe more bedrooms/sleeping space is desired in this region – but this house backs up to a golf course. It’s NOT, IMHO, a year-round, live-in family house. Maybe the family comes to visit, but children, being children and making noise in the backyard is probably frowned upon by the adjacent golfers. So you are not marketing to families – you are marketing to empty-nesters who want their grandchildren to come visit twice a year. Take out the furniture in the upstairs open space and let buyers imagination run wild. At the end – there are buyers who have vision and buyers who don’t. If you get sucked into making a lot of changes to accommodate the buyers without vision, you are still going to lose money. Take all the great comments here, make a few minor changes and lower the price. There was a house down the street at 5 Kings Lane, built in 1997 – 4 bdrms, 4..5 baths, 3,442 SF that sold for $1.03M on 6/2017. BUT IT HAS A POOL. Another house nearly next door – 16 Kings Lane is on the market for a whopping $1.725M built in 1989 with 4 bdrms, 5 baths, 4850 SF,AND it has a pool, but its a flip. Last sold 5/2017 for $725,000. Ah, subjectivity…. one’s junk is another’s treasure. I think that ornate gold framed mirror, the console below and blue and white chinoiserie pieces are some of the most attractive things in the house, making for a classic entry, island home or elsewhere. These are all Timeless Elements of Design. To change out such beautiful quality items by going “to Lowes, Target, Home Goods and get a more contemporary/transitional cheap replacement.” IMO is a step in the wrong direction. Change out quality for inferior trendy cheap pieces?? This is a pretty home, in a great area and what a lifestyle you can have here! The copy and photos in the listing need to work a LOT harder to get this across!! Starting with the copy: REWRITE IT so the reader really gets this idea. The house is perfect for an indoor/outdoor lifestyle: play golf, go to the beach, go boating. Or, hang out at home: multilevel living with plenty of room for entertaining family and friends. At the end add more tactical items. 1. the last photo in the listing is the prettiest! 3. Aerial that shows how close it is to the water. Again, EDIT the interior photos, no need to show master bathtub twice, when it is so prominent in the first photo. Turquoise room, use the one looking towards the window, much prettier view of the room. Great room, use the photo that shows that bank of windows. I would eliminate the runner in the living room. As to the rug in the foyer, I would consider replacing it with an Oriental carpet that is a little shorter than the existing rug. The existing rug extends past an entrance on the right. Having a small carpet will help define the foyer a little better. The colors of an Oriental carpet would help warm up the foyer even more. The vignette on the mantel in the living room could benefit from non-electrified gold sconces or gold candelabra, or something gold that will complement the gold metal of the cover of the fireplace. It will help bring the eyes up. I also agree that adding a sofa table behind the sofa would be great. That would be a good place to place two lamps and eliminate the lamp from the end table next to the sofa. That end table, by the way, could be replaced by a slightly shorter, squarish table because the round table does not seem grounded to me. Regarding the photo of the kitchen and dining room, the wall that is visible behind the stairs could use a large painting or something with some color. The furniture arrangement in the family room could be reoriented so that the back of the sofa faces the entry to the room from the adjacent room. And perhaps the upholstered chairs can face each other rather than being side by side, in order to give the arrangement a more casual feel. I think the color of the sofa is too strong and could be softened with a nice blanket, scarf, whatever, draped over the back. There’s probably a name for what I am trying to say, but I can’t think of it at the moment. Yes, as to palm trees or some other plant in that room. The master bedroom is lovely. I would retake the photo with the pendant lights turned off. The shadows on the ceiling are too distracting for such a beautiful room. The upstairs room that Cyndi is not crazy about could use some artwork on the wall to the right of the closets. I am not sure what the curtain rods look like, but I wonder if the can be hung without the valance. Or perhaps do away with the curtains altogether and add a Fiddle Leaf for interest. Also, retake photo with lights off. I love the powder room. I think it can use a pendant light with more pizzazz. A red pagoda type lamp? I know this is silly, but if you retake the photo, replace the roll of toilet paper with a fuller one. Haha. In the listing, there is a photo of the balcony that shows two chairs and a table. I would remove the table and replace it with a garden stool (or something like the orange block in the garden) with the chairs facing out. My two cents: It’s a gorgeous property and a lot of thought and good taste has gone into the furnishing. The furniture is formal for the look of the look of what would a relaxed vacation house. Starting with the entry chest and gold mirror, which are a little intimidating. The living room has a lot of legs and hard edges- legs on the couch, the chairs, the side tables and the consoles. I imagine that softer, beachier furniture, that is more casual and inviting to sink into might align better with the house and appeal to buyers. In the dining room, I would consider taking down the drapes – a print on the chairs and the drapes distracts from the room. Likewise, the blue couch in the family room demands attention away from the wall of windows and the view that should sell the house in an instant. First I love the house and most of its furnishings! The bathroom wallpaper is beautiful. But I agree with most about the middle rug. It hides the lovely floors. If she added a table behind the couch, I noticed plugs for a pair of lamps. And the clown picture I find scary. The kitchen is small, for me anyway. Not much you can do about that. I thought people’s ideas about getting more beds in the house a good one as this area is a holiday destination. In all due respect, IMHO, no home will ever appeal to all ages – period! There are (some) much older people who are used to dated things, (some) boomers who prefer Classic Design, most younger people who think HGTV is the be all and end all and that the likes of Pottery Barn and Home Goods reflect the ultimate in an interior! There are those who think trends equal quality Design and others who understand the difference in Timeless Style. Identifying the MOST likely target market for a home is key, but with a home as tasteful as this, I’d like to think buyers in that financial category would be savvy enough to realize they are NOT buying the Seller’s personal furnishings and accessories and can visualize a space as their own along with its many possibilities. Sure, one should make that visualizing as easy as possible, but where does it stop!? What a beautiful house! The toile bathroom is perfect. Makes me wish I wasn’t in Canada : ) . Sorry mrs ben it was Dee dee who was unaware of how heat pumps worked my deepest apologies. Another comment: Cyndi you have done a beautiful job decorating and of course it and all the renovations were done with a plan to remain in a full-time home. I hope that restaging, new photos, re-written listing and additional listing exposure in other markets will sell it without major additional work. First of all, I love this house and all of the decorations for living there!! It’s perfect. But as a certified and professional stager, I would do some different things for selling. Decor for living and decor for staging are two very different things. -Love the landscaping. It’s relaxing and beautiful. -Main entrance- Replace everything there to more casual furniture. The chest, mirror, and art are too formal looking for the area. The rug is also too big. First impressions are very important. -Living room- Remove all the orange color and replace with neutral or blue color. Remove the clown picture. Remove the rug on top of the sisal (you don’t need a rug on top of a rug). Remove the rug behind the sofa. Love the sofa and coffee table. Replace the table next to the sofa with a table that is more like the coffee table. Change the blue lamp and jars to simplier accessories. There are too many jars in the house. Add a large plant or two. I love the jars, but not everyone will. -Kitchen- Put a plant on the counter. Put a tray with 2 small coffee mugs, bag of coffee, and small coffee pot in the tray for lifestyle look. Remove the rug. -Dining table – Love the light fixture. Remove everything on the table except the plant. Sunroom – Replace the two ottmans with a glass top coffee table. Change the orange lampshade to white. Remove everything on top of the chest except the plant. Raise the shades all the way up. Master bedroom – I love this room and the bathroom. I would only remove the orange pillow. Aqua room- Take all the drapes down. Change the aqua color accents to the blue being used in the other rooms. Change this to a kid’s room. Use twin beds with the white night table between them. Love, love, love the ceiling fixture, white chairs, and ottaman. Upstairs bath – Replace the mirror with a simpler one. Use a white or navy towel and put a plant on the counter. 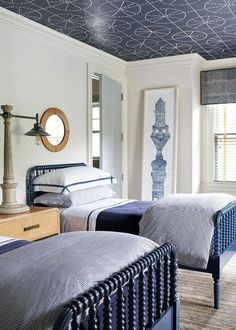 Upstairs navy bedroom – Love the navy color and night tables! Change the lamps on the night tables to white. Remove the jar from the dresser. Remove the orange frames. Maybe change the wall picture. 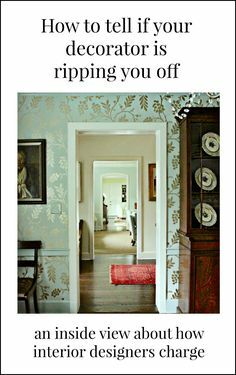 Bathroom with wallpaper – Remove the wallpaper! There are mentions of moving the sink to the window. There isn’t room for a centered sink and a dishwasher next to it in the layout. Unless the fisheye photography has distorted that area to look narrower than it is. Many excellent and interesting suggestions about staging and the listing. Interestingly, Laurel’s recent post about the older home update, showcased a similar beamed ceiling treatment (with a beadboard ceiling). I think the SSI photos are highlighting the ceiling detail but as mentioned the photos make the 9-10’ ceilings look lower than they are! 1) the orange chairs/accents. Many folks don’t like orange—replace with green. 2) open stairs with transition from brown floor to white wall with light underneath. Looks very jarring. Perhaps a cheaper way to give more cohesiveness would be to paint the treads white and the wall behind brown to match the floor or tan to match the sea grass and put a sea grass rug over the floor to create a visual sense of treads. Ground the area with a large plant. Turn off that light!! Open the door at the top of the landing with a plant to make that space seems more welcoming. 3) the heavy formal valence in the spare room—Take it down. To begin; took a virtual tour and agree with you Laurel when comparing it to the photos the latter are terribly distorted and to a point, misleading. To conclude and being brief as possible; IMHO it appears to be a lovely home with a location that no doubt appeals to a certain market however to be honest ‘personally’ I couldn’t care less how it is decorated or staged. That being said my main concern would be the home’s main features itself as to its structure, location, fixed elements and general layout. i.e. : Is the structure sound and is it located in a flood zone or built on swamp land? Due to the golf course, are there current privacy issues or is it possibly slated for future sale to make way for the redevelopment of a mega mall or housing community? What would I want to change (the open staircase for sure) and the additional costs involved? In summary; do wish Cyndi success in selling her home and hopefully there will soon be a buyer who has vision that appreciates it for its bones/location and will soon snap it up to make it their own. Beautiful home…..gorgeous. 3 months is not a long time in that price range I am thinking. A royal pain, of course, but not that long in the grand scheme of things. We have just built a home in a resort / retirement community and one of the most popular features with our builder has been a walk-in pantry with closed in lower cabinets, a counter with electrical outlets for small appliances and painted wooden open shelving up to the ceiling, hidden behind tall cabinet doors. Perhaps that is something that can be put under the stairway for minimal expense to counter the smaller kitchen size while adding some wow factor. -get new photos taken per Laurels suggestion. -A really good book I’ve read on the subject is “home staging that works” by Star Osborne. The author goes into how home staging is different than decorating. You’re basically targeting a certain demographic. So for instance, an older baby boomer would prefer some type of library or office, a young couple would want a child’s bedroom, and so on. A beautiful home but what kind of home is it? A home for possible rental? An empty nester full time home? A full time family home? For the first two, a pool is a must. Preferably with a lanai due to all the critters who will also make themselves at home in a pool. It is very hot, humid, and buggy in that area so while an outdoor area for sitting is nice, it might not be used very much. If it is in a flood plain, I as a potential buyer might just look for something else not in a flood plain. Is this home on a golf course? A good and bad thing depending how you feel about golf. I like the privacy, but what is this a good house for a family? Where is the neighborhood? What are the schools like? Your home is gorgeous! And in my favorite place – St. Simons. Have you looked at what IS selling that’s comparable to your house? That might offer clues. If you really want to move it, try a price drop and see if that brings in new buyers. Also, I agree with Laurel about getting new photos. Tons of great comments. Seems to be some confusion on whether the master is on main floor or up. According to listing, master is on main, first floor. So that is a plus in a retirement area. I agree about the staircase. Perhaps could add more pantry storage under the staircase to block it in. Maybe update the railing to the staircase or paint it? Although that would mean spending money, of all the “fixes” the stairs would be my priority, as I think the majority of buyers do not like open stairs, especially in retirement area. One more suggestion, move the formal looking dining table from being the kitchen table–get a big informal table in pine or something sturdy and beachy! Don’t know if there is another area that could be double purpose as a dining area. But again, people are NOT buying the furniture! There are a lot of plusses and it’s all out there for Buyers to see upon touring the home, it is what it is and there has to be enough buyers that can visualize out there. There are some great suggestions here, but there are some others that if I was buying the home and they changed, I’d be disappointed…. like that gorgeous timeless blue and white Chinoiserie paper in the powder room! Leave it! If someone doesn’t like it they can change it! But many people would love it. The turquoise in the upstairs bedroom, some may dislike, others may love it. People comment about making it have more of a beachy, island home look, well turquoise works. I personally think it’s a great beach color and it’s already there, so leave it for those who may love it, don’t destroy it. If someone doesn’t like it they can take it down. I love the idea of switching out living room furnishings with the family room, that’s using items already in the home with no additional expense and would give a better transition from the foyer to the living room. A Stager here recommended putting the shades in the family room all the way up…. WHY!? Perhaps to maximize the light but the space is quite bright. Shades all the way up just look wrong. Those shades allow light to come through and for all those saying the place should have an island feel, those shades have it. They are fairly high up but down enough to add their own bit of island style to the room. Suggestions to substitute quality items for “cheaper Home Goods” pieces!?!? Switch out a chandelier for a ceiling fan!? Seriously? This is a home in a million dollar market. OY! To Cyndi, fear not, your home will sell. Great suggestions here but some are in fantasy land where money is no object, others want you to change out your timeless classics for junk from Home Goods or the like! OY! Who knew what you were getting into here! LOL!! Great to get all perspectives though. I agree with a great many points made here-some from professional stagers like Lorrie. Though beautifully designed as a family home perhaps she should consider focusing on her target market. I would discuss with the realtor what kind of property the home’s visitors eventually purchased—were they looking for a leisure, golf, or beach property? As Lorrie so well stated “you’re selling a lifestyle”. Perhaps a few changes or the assistance of a home stager would be of some help. This way she wouldn’t have to purchase any new pieces that wouldn’t go with her new home. Changing out a few pieces and adding different artwork and repurposing some rooms using the staging company might be a good idea. I agree with you Laurel, that many of the homes in the area have a pool and well developed outdoor area to better enjoy the stellar garden. Maybe this is something she might consider undertaking in order to sell in the next year. It also seemed from the photos and video that the rooms on the ground level appear a bit dark and oppressive (this could also be the photographer) but if this is the case perhaps lighting issues should be examined and corrected. Finally, it appears from Zillow that many of the properties of similar size in the same area have been on the market for over a year to 18 months. Prices have dropped considerably in the area but it still seems her’s is well priced so lowering may not be as well received as creating a better impression for buyers. I think Deb has made some great points. I live “up the road” from Cyndi on Skidaway Island outside of Savannah. We purchased a home last year built in the 1980s (don’t get me started on how bad much of the architecture was back then) and spent six figures renovating the 80s out of the home. Cyndi, I think you’ve done a lovely job decorating – I agree it needs more warmth and greenery. It looks overly staged to me. I don’t agree all homes down here should be “beachy” in decor. Who wants to look the same as everyone else? I took a British colonial approach to decorating our home. There are many wonderful alternatives to blues and greens and oranges and blues are lovely! What a gorgeous home! Who couldn’t love this beauty? I couldn’t see any problem until I read the listing. Perhaps people may be frightened off because its in a flood zone and the homeowner requires flood insurance. I’m Australian so can’t comment on local preferences and price points but would like to share an outsider’s impression. Your real estate people are your biggest handicap. ‘Overhaul’. Really?!? What horrendous calamity required not one, but two, complete overhauls? Overhauls are what you need when you’re broken down and in bad shape. The presenters have limited vocabulary; according to them everything is ‘amazing’ or ‘great’. Is it a common practice to have real estate agents performing? I found them off putting and kept wondering why the house needed overhauling. Laurel you asked for simple fixes so here they are. Add soft blue green abstract art.. in place of anything that isn’t. Chinese style anything gone exception ginger jar. Remove the small accessories, if you feel you want some small items use some blue green glass floats. I’d strip the busy blue and white bathroom wallpaper and just have that room painted. Pretty much agree with Debra here! Might keep the Master Bedroom rug, for instance, but the ones lining the entry have to go!! You are selling the hardwood, not your rugs, and you’ll be surprised how much better the entry will photograph. Also, while the orange is gorgeous in decor, when photographed, it takes over the photo — that is why you remove it. Honestly, I looked at the real estate available there and I think it’s primarily that at your price point houses are taking a year to sell. And that’s normal all across the US. This is a community of second homes and retirees. There are no jobs here, and that is why you are moving. The available pool of buyers is small. That’s just the way it is. You’ve only been on the market for 3 months. But the second issue is that you have a lot of competition. For $300k less a buyer could have a pool, or at your price point they could have waterfront. And there’s a house set at half your price that has a pool and a lot of “wow” factor. I suggest that you look at the houses that have sold in the last 3 months. If most of them were waterfront or had a pool then your price might be 100K too high because you don’t have those features. I know this is frustrating because you loved that house and bought it, and your price isn’t much higher than what you paid. But if you’re in any house for only a year you’re going to lose money when you sell. You haven’t been in that house long enough for appreciation to defray the sales costs. You have set the price $100k higher than what you paid for the house. I know that you’ll have sales costs but the market might not agree that it’s worth more now than it was a year ago. I agree with everything you said, especially the price being too high. According to Zillow, in April the house was listed at 1,269,900 and the last time the price was dropped was 4/25 to 1,150,000. I’d drop the price by $10-$30k to drum up some new interest in the house. Cyndi, thank you for sharing your home and proving that Laurel’s advice really works. You’ve done such a beautiful job! There are some staging suggestions I agree with – especially rolling up the rugs to showcase the floors. But really, it comes down to price and the listing, which falls flat. Saying it’s had two major renovations makes it sound like there was (is)something wrong with the house. The seller needs to sell it. Write the description yourself to capture the magic of the place and get photos done by a magazine photographer, not the realtor’s firm. The hardest thing for home sellers is to look at the asking price from a completely subjective, market-based perspective. Are you trying to get back what you put into it and is that more than the market will bear? If so, you’ll narrow the audience and the listing will languish. I’ve bought and sold several homes including vacation homes & I agree with others that since this is in a beach area, it needs to look like a beach house. Even if it’s not going to be a vacation home, people move there because of the lifestyle- the house needs to reflect that. There’s a beautiful traditional house in my mountain town that has been on the market for five years, with a 200k price drop, because it’s a brick house that looks like it belongs in a tony Chicago suburb, not a ski town in the Rockies. Cyndi’s house has an exterior that’s fine for the area, but the interior needs to support/reflect the wonderful outdoor-oriented lifestyle there. Given the traditional exterior, I’d go with an upscale but casual Key West vibe or even a fancy Palm Beach feel (i.e.. the guest rooms at The Breakers), as opposed to Miami modern. Let me also add, now that I’ve been through the other comments and have seen that there are no other posters from SSI – there is stiff competition in your price range. (Every house I wanted and couldn’t afford before we decided to build was right at that point, and there were plenty!) What you have that other, newer/flashier construction in that range generally doesn’t is a private, spacious, yet south-island setting. [Note to anyone else reading – the island is only about 12 miles long, but few roads/low speed limits/traffic make it a production getting around. “Downtown,” as it were, is on the southern tip of the island. LW is on a wooded .59 of an acre, which is large for the bottom 2/3 of the island and downright huge for how close she is to the main attractions]. The other houses I see at $1.1-1.4m or so generally much feel larger and newer. Yours is beautifully done, but the restrictions put on you by the architecture have you at a major disadvantage. However, I would KILL to be so close to the village/mid-island without being crammed in on both sides. There are plenty of houses for sale on the south end, at a number of price points, but VERY few with any seclusion. The drone picture shows this a little bit, but your listing is doing you absolutely no favors in highlighting the main thing justifying that price bracket, which is its location and lot size/privacy. I’ve lived here for years, was so excited to see Laurel post about SSI, and then immediately assumed your house was in Sea Palms [golf community 5 miles further from the beach with mostly dated 80s homes, where the few updated ones are out of place and sell for less than $1m] when I saw the pictures. You need a realtor who appreciates and can play up the value of your unique location if you want to get anything close to the current asking price. We’ve used three different realtors here and have had wildly varying experiences – let me know if you want me to put you in contact with the one we’ve vowed to use exclusively from here on out. She is a force of nature. Thanks so much for your very informative comments, please make me privy to your specific recommendations and your experience with various agents. I am currently making some tweaks to the house and will contact Chris- the photographer you mentioned. After spending some time on listings for Saint Simons Island, I agree with you! The lot is the big draw for this listing. There is a lot of competition and some beautiful homes from an architectural and design standpoint. It’s the lot that sets this one apart. I also realize from looking at other listing on SSI, that the kitchen is small, even compared to much lower price points. It is also more exposed than most of the competition. I think these factors might be a sticking point for a lot of buyers. The house is beautifully decorated and most of the rooms appear to be a good size. I believe the main issue is the small size of the kitchen, there does not seem to be enough cabinet space. Could you add a wall of cabinets on the wall in back of the staircase? It might work well as an area for some floor to ceiling cabinets and a pantry. Also, the long drapes on either side of the bay window seem to close off the pretty view and the architectural interest of the window. I think that you could give visitors the feeling that the dining area is part of the kitchenm making the kitchen seem larger, if you make some simple changes. If you do want window coverings, perhaps the bay window would benefit from wood shutters. Does it get too much glare from the sun? If the sunlight and privacy are not an issue I would leave it uncovered. If the top of the cabinet (is that an AC return?) under the bay window were covered with a counter top that matched the kitchen counter tops, it would make a nice serving area and would give the impression of being part of the kitchen, making it seem larger. one or two small recessed lights would be nice over that counter. I would also upgrade the pulls and knobs in the kitchen. If you could have the risers on the staircase closed by a trim carpenter, most people would prefer a closed staircase. I find that people tend to trip on staircases with open risers and they are not comfortable to use. I have been both a designer and realtor for over 35 years. Kitchens and baths sell homes. The master bath is nice but needs a bit of “drama”, how about some color or contrast in the towels. The listing photos would not be enough to keep me from having a fit to see it if I was in the market for a home. It is too beautiful and with a million possibilities as far as how the spaces can be used. I am an “old” Georgia girl. Have spent many many many days nights months and weekends with friends and loved ones on St Simons and on Sea Island since I was too little to remember not going. As the island changed and grew I’ve heard everyone’s mother, aunt, grandmama and friend discuss renovations and new builds, the topics that come up often, and what people “rather have”’than “rather not” in a home so I couldn’t help but throw in my 2 cents . Southerners entertain at home and you have just the right kinds of spaces to accommodate a crowd but not feel cavernous with just a few. All my intel comes from cocktail parties, bridge lunches, tennis games, game day parties, 6 dozen weddings on St Simon’s or on Sea Island because folks love to talk about their houses, and contractors and decorators. will shift to zoom in on detractors and two things stick out to me. The sliding glass doors. They should be replaced with French doors (anything with panes) panes and panes and more panes. Doors that open out onto the outside will make your entertaining space expand exponentially. The floating staircase looks makeshift ( it could be the photos). Perhaps there is an architecturally appealing /authentic way to augment the banister, add risers, etc and make it look and feel more traditional and substantial. People with children or grandchildren will see it as “danger danger” ) with no risers. The screened in porch is such a plus. Positioned perfectly to catch the evening breezes. with chairs lined up facing out to catch those breezes. I can see a row of Brumby rockers with an over stuffed pillow in each and a garden stool or 2 or 3 for drinks and a magazine or book. If you are thinking of staging the upstairs so it looks like it will sleep the grands and great grands there is nothing more wonderful or “island-Ish” and practical than a sleeping porch. Would two hanging swinging twin beds fit if installed side by side? Then I would swing those new French doors into the room. Ive also been wrestling with the TV in the living room. It is absolutely necessary to have a television somewhere in that kitchen/dining/living space ( think parties when everyone comes to the island for the Georgia/Florida) but somehow it needs to be disguised. Maybe if it is hung on the wall in the alcove where it is and find a way to mascarade the black rectangle? Just so that it disappears when turned off. The a/v technology and its positioning with the peripherals and plugs and wires have to be seamless and deliberate and planned and plug and play. What an amazing job you’ve done, you have such an eye!! Your home is beautiful. 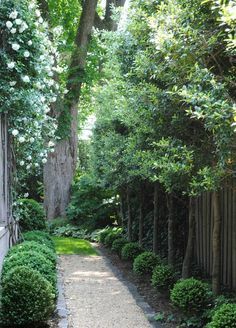 I can feel the serenity and lushness of the home and grounds. Wonderful location in a lovely part of the island. With excellent neighbors I’m sure. * In the family room, there is a large console blocking what looks like sliding door. Relocate the console. * Beautiful light fixtures throughout but casting distracting shadows on the ceiling. Re-photograph with lights turned off. * Patio is nice but needs an outdoor kitchen. * Stage upstairs as the kids hangout; add lots of bunk beds. Repurpose the family room as a spacious dining room. The current dining area and kitchen feel small for the house and not elegant enough for the living space. The family room furniture is too stuffy. Relocate the fridge under the open stairs, close them up. Remove the upper kitchen cabinets…see recent posts about unkitchens. Create storage under the stairs next to the fridge. Navy bedroom wall too dark. Multi purpose space feels like you didn’t know what to do with it. I would use it as a great room, with several areas for everyone to hang our together. Again, the navy is too dark here. Perhaps you can take some of the white furniture from the turquoise bedroom and use it with the mustard. Show the turquoise bedroom with two charming single beds, or bunk beds, if that works. But the house needs a kid’s room. I need to see some book cases, because even if I’m not reading, they make me want to sit and relax. Perhaps in the formal living room over left nook. Or in the multipurpose room. EDIT! Put your things in storage. Around here, the walls have to be a gray or white. Tan, yellow shades look dated. I love the warmer linen whites and creams but when you look at houses, you compare to the crisper cooler shades now in vogue. I think they play up the blues in the house better too. I am not familiar with this exact market, but I know a bit about the Plantation in Amelia Island, Florida, an exclusive gated golf/beach community located just a little further south along the same chain of barrier islands as St. Simon’s. My biggest reservations with this house have nothing to do with how it is decorated, or the lack of a pool (there is more than likely access to a pool within the community). I see two primary drawbacks at this general price point (over 1 million): lack of a 3 car garage, which is nearly a standard in an area where houses are built on a slab and lack a basement, and the tabby shell stucco exterior. In the 1980s through early 1990s tabby was fairly commonly used in the area as a more affordable option to smooth stucco, but it soon fell out of favor. I’ve learned from speaking to contractors that replacing tabby shell on a house is labor intensive and very expensive. Your home is truly lovely! As a realtor, I can imagine that it is a delight to show. If I may, I would suggest a few staging changes. Mind you this is only for staging purposes. 1…I agree with others that the rug behind the sofa is cutting up the space and not showcasing your wood floors. 2…The same thing with the kitchen rug, I agree that it visually cuts up the space. 3…I would remove the oriental in the living room and simply have the seagrass rug ground the space. I think having them both is fine for decorating but for staging it complicates the space. 2…it also seems to me that the kitchen sink would be well placed under the windows and this is distracting to me. Perhaps a couple of nice topiaries in front of the windows would give the space a sense of purpose. 3…I think that the Blue and white vase looks great. I would add a couple more and then on the outer end of the peninsula a blue and white planter with a pretty orchid. !…As someone else pointed out it would be best to remove 2 of the chairs in order to create more flow for multiple people to walk around and through at one time. 1…In my market, this would be a tremendous asset to have 2 full suites and I would suggest staging it as such. 2…While the table and chairs are a nice addition to the attached porch, in the photos it looks as though it is a tight squeeze to get past them. If this is true then I would suggest a couple of wicker chairs instead. 1…I suggest placing fresh flowers in several places to add color and fragrance. I especially like them on a desk. 1… Some colorful annuals – I was once told by a professional stager that when folks are touring several houses at a time they will remember the house with pops of color. Lastly, if possible, I would update the staircase to better flow with all the lovely mouldings and trim. Open treads seem to turn away some buyers. I looked at the actual listing and it’s difficult to understand the floor plan. Get your realtor to add a floor plan, even though it means loosing a photo. Indeed decor for living vs staging is very different. I was very shocked by how we had to radically ‘redecorate’ our house when we listed it. I’m about to loose my mind over the ‘ farmhouse ‘ look/ pottery barn aesthetic. Maybe you need some shiplap 😜🤣. No seriously, your house seems well decorated but not overly cluttered, and it seems to show well. I agree, make every possible room a bedroom. Couples like to sleep in kings, but queens make a room look larger. Maybe make the turquoise bedroom specifically a kids room,as mentioned above. Also show the laundry area, for some odd reason,buyers get seriously hung up on laundry location. “You are not just selling your home, you are selling a lifestyle.” Since you mentioned the “proximity to a golf course” is desirable, perhaps you could strategically add a few “golf” props. Maybe replace the foyer art work with a few nicely framed pictures of the golf course “they will be able to play at!” Also, if you have a golf cart why not add a picture of that ? Maybe include with purchase of home? Definitely stage any additional rooms you can as bedrooms. Since you know that the lack of bedrooms is an objection, I would try to present an alternative! it now occurs to me that the abundance of sea grass and other rugs is an attempt to keep the floor nicely clean and shiny when visitors traipse over it. Sigh. It is in a flood plain. If I had a luxe house like this, that would bother me. Does the seller make available a list of potential local employees to do the usual household cleaning, gardening, and chores? Might make a difference to some potential buyers. I just don’t care for a dining area practically in the open kitchen. Not formal enough for fancy house parties. And I don’t want my guests seeing the kitchen unless the food has been brought in from outside and every inch of the kitchen is spotless. Or perhaps, the guests can help prep the food and drink wine around the kitchen counter, but it still will not look , IMO, like a +million dollar house. Is there a bathroom for the help? Where is the shower in the master bath? The ceiling lighting is harsh, IMO, and the rugs under the furniture look like islands, which makes the rooms look too big or the furniture too small. I’m not keen on the furnishings. I’m a Sister Parrish kinda gal. I agree with Laurel that showing the place as ready for houseguests/visiting grandchildren is a really good idea. Laurel, your suggestion of soft draperies also flies with me. Im all for making rooms look soft and welcoming and the right draperies at that spot is just right, IMHO. Every other issue i might have has been covered by other readers. Wishing Cindi all good luck in finding just the right person for her house. Beautiful home! I checked out the broker listing and I came away craving a floor plan. Even the video showcases individual features – it left me confused as to how the house actually flows. Why not use at least a portion of that medium for a “walk thru” as I see on many other listings. Maybe 1st floor masters are common in that area, but it’s a feature many like me look for and I’d highlight it. There are a few things I would change in the kitchen, but that’s personal preference and not a factor in whether I would purchase. This home and yard is absolutely gorgeous and I’m not sure why it isn’t selling. As someone mentioned, maybe it needs more advertising? I am a Home Stager and Interior Decorator (have had my own business here in southeast Michigan for almost 10 years) and I could only dream that my clients’ homes would ever look like this! As a decorator, this home is perfection – 10/10. As a Home Stager, I can see a few things I would tweak, but they would not make or break a deal. I always tell my staging clients that less is more and that we are trying to sell your home, not your things. So the following list I came up with are very minor tweaks, but I’m looking at the home with my Home Stager hat on and not my Decorator hat. * I would remove the seagrass rug in the entrance. You want to show off the beautiful hard wood floors and the photos look cleaner and the area/rooms look bigger with area rugs removed. *I would remove the seagrass rug behind the sofa for the same reason as above – show off floors and open up space. *Remove the area rug under the kitchen/dining table. Again, this helps to show off the floors (which is what you are selling). *I would add a few more decorative accessories to the kitchen counters, along with a plant or vase of flowers. *Remove area rug between range/refrigerator and counters. *Remove faux fox sitting on floor in sunroom (adjacent family room). *Maybe add a pop of color on bathroom counters with a fuchsia orchid or bright orange roses. *Remove exercise bike from upstairs office. If you were to do the above, I would have the realtor take new professional photos for the listing. I think it would make your listing an 11/10. Again, I don’t think they would make or break a deal. I wish you all the best for a quick sale! Please keep us posted here. Although this home is nicely done I do not see any continuity of design concept throughout. There are traditional spaces, more transitional and almost contemporary. The rooms are not warm and inviting but look almost”staged”. I think a buyer needs to come into a space and be able to see themselves living in the space. There isn’t a lot of character. Accessories?? Plants?? books?? Something?? The master bath looks dated and the kitchen, with the U shape is not at all functional – walk around that U for everything outside of it. Creating an island and getting rid of the “U” would be a huge improvement. Is the guest room just that twin day bed? Impractical? Was just in St. Simons a few days ago! LOVE, love, LUV! I seriously can not imagine this property NOT being on someone’s list. Curious as to the price point?? I agree: more plants, more bedrooms. Show the bedrooms by renting a ton of beds. Put a queen or king in the aqua bedroom. Remove all but one working space. Even with a zillion pictures, I still don’t have a feel for the layout of the home from these pics or the video, so if I am looking, I might just skip it even if I could afford the price. I agree Laurel, this home is lovely and all of the suggestions you made were spot on. The thing I would add is to remove the large rug behind the sofa. It is covering up the pretty floors, doesn’t need to be there to define any space, and just feels “too much” IMO. And you’re so right about the photography! It makes the house feel dark. Could photos be done using only natural light? Or maybe the existing photos could be edited and lightened?? The house is beautiful and I would think it would have sold, also. I have two issues. The first is what is going on in the master shower? It looks like a rain shower head over a bench, which might be odd. Second, it looks like they went cheap in the kitchen, which is a hug turn off for me. The upper cabinet doesn’t go all the way to the edge of the backsplash on the side wall and why did they not go for a counter depth refrigerator, with wood panels? The knobs and pulls, on my screen, don’t look like they match. So please, it’s not you, it’s them. 1. It appears it may be difficult to readily navigate the living room, eg walking a figure eight through the sitting area. Edit it to an almost spare degree. Just to sell. Get rid of anything looking too leggy. Pare it all down. 2. Store that navy high backed couch in the multi windowed room. Too high. Too rich. Too blue. And move the pair of chairs at the window in its stead. 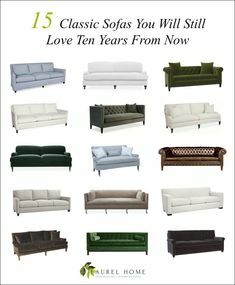 Then or instead purchase a very inexpensive and light colored upholstered bench to either replace the couch or the pair of chairs. Good luck. And please consider how many people utilize home listings as fee free house tours. Our people did. Made us nuts. Require your own realtor present for all showings. If you do not respect yourself neither shall the local real estate community. Beautiful home………..congrats for your taste. Never take that for granted. I also thought that the dark blue sofa in the many-windowed room should go. It doesn’t really suit the style of the rest of the room and stops my eye. Also, I’m distracted by the partway-lowered blinds on all of those windows–could they be raised further? I also agree that this home is GORGEOUS. And that they may be “outclassing” their audience. Add the sofa table in the main living room, add beds and/or bunkbeds, get rid of the louvered closet doors in the turquoise/white room, add some easy plants, and maybe add “fun” family-oriented items to the large bonus room.